But I am thinking: How I am supposed to give him a grade? What does the teacher expect his performance to be? How does he know if he is doing well? How do I know? How do I justify what I write down on the paper to send back to school? Of course, my wife was out of town training on Project-Based Learning, so it was up to me to pull this off. The accent wasn’t in the assignment, but it was implied by the faux-Colonial English used to write it and is also something that he enjoys. We decided to do the assignment the evening. 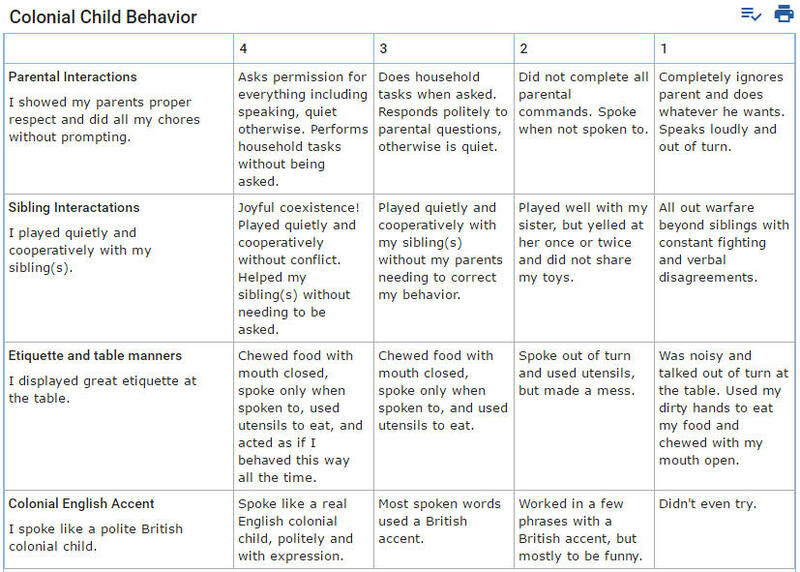 Since he had already lost interest in specifics, I launched Wixie on our home Chromebook and started a rubric. If you haven’t used the rubric maker in Wixie, you can explore it from the Assessments tab in your teacher account! When we got home the next evening, my son immediately slips into his British accent (any excuse is a good excuse), and starts being nice and helpful...and altogether not himself! His sister even starts to get into the fun. Near the end of the evening, we launched Wixie and reviewed the rubric. We talked about his behavior and graded his efforts together. While he tried really hard, an 11-year old and a 6-year old were never going to be able to achieve “Joyful coexistence” no matter how hard they tried, but he did manage to achieve a 3+. I signed his paper, wrote down his score, and stapled a printed rubric to the sheet so his teacher could see where his score came from. So what’s the moral to this story? Wixie has a built in rubric maker so you never have to send your students off to do a project without any idea of what they are expected to accomplish or how to achieve it. "Use it, you’ll love it, it is the best rubric maker ever. It is going to be huge."